How to stencil with paint and brush - Design Inspiration. Planet Stencil Library. Stencilling with paint is an easily acquired skill. It requires that the artist uses very little paint. This is how we stencil at The Stencil Library. In this demonstration I am using a soft stencil brush and fluid acrylic paint. This is my preferred method of stencilling. Other water based paints such as emulsion/latex paints can be used. We usually recommend a light misting of spray repositioning adhesive onto the back of your stencil to hold it in place. Use the lid of the paint pot as a palette. When this is not possible, pour a little paint onto a plate. Dip a stencil brush into the surface of the paint (so that just the tips of the bristles become coated) then rub the loaded brush firmly in a circular motion onto paper towel. This action distributes the colour evenly throughout the bristles and works the paint into the brush. Find a clean patch of towel and work the paint a little more to dry the ends of the bristles. The paint should be damp not wet. Practise the following test to ascertain how little paint is needed to stencil with. Tap the brush onto scrap paper and run your finger over the mark that it leaves, if the imprint appears clear with no smudge then you are ready to stencil. If there is a smudge you will need to remove a little more paint onto the paper towel. The paint is usually applied in one of two ways. To stipple is to apply the paint through the stencil with a gentle tapping motion. Another stencilling technique is swirling whereby the paint is 'tickled' onto the surface with a light circling motion of the brush. Make sure that your brush is at right angles to the stencil. Add a second light layer for depth of colour or shading. A combination of both techniques can be used. I prefer to use the larger sizes in the stencil brushes that we offer as it saves on effort. I use the small brush size for details and edging. When planning your project, bear in mind that you will need a clean, dry stencil brush for every selected colour. If using our recommended paint, your brushes should clean easily with hot soapy water. To remove tougher paint or dried on colour, use our brush scrubber, they are cheap and brilliant! Make sure that the stencil brush is completely dry before using again. 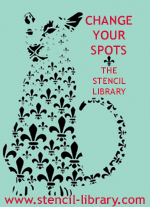 The Stencil Library has a huge collection of stencils offering many styles, sizes and subjects. Great tutorial on "how-to" on stenciling! Thanks for taking the time.